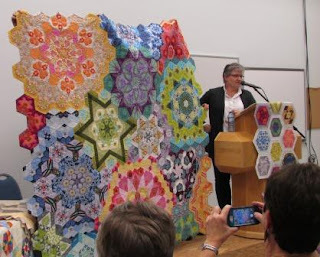 I got to go see Katja Marek and her beautiful hexagon quilts. I took my mom too. I had seen some of these Millefoire quits on the internet but did not really understand what it was or how they were getting put together. Well now I kind of understand the beauty of these quilts. If you want to see more then what I have here go see Katja's web site about the Millefoire. I am not sure I will work on the Millefoire quilt, but I think I will do more of a sampler. So after seeing her quilts I just had to start some blocks myself. 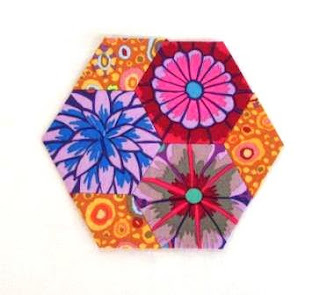 This is block #1 from her book The New Hexagon. 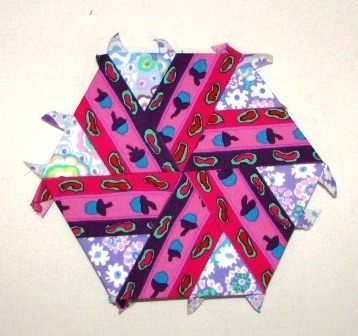 I had to use the Kaffe Fassett collection and work on some fussy cutting. For now I am happy to just make some blocks. This is Block #1 again. These blocks are all hand pieced using English paper piecing. Block #2, I just love the pencil fabric and love how it turned out for this block. 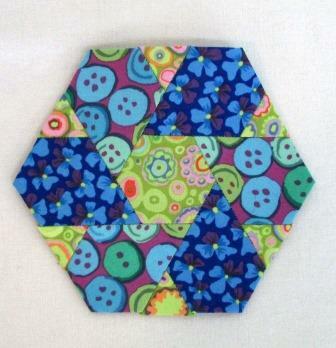 Block #3, some of the pieces are pretty small like the little green triangles. Katja says to glue baste the fabric to the paper. I have never used glue but tried it with glue. I am hooked on the glue basting, faster, helps with the crazy little pieces, and not to sticky. The first few blocks together. Here is the book. 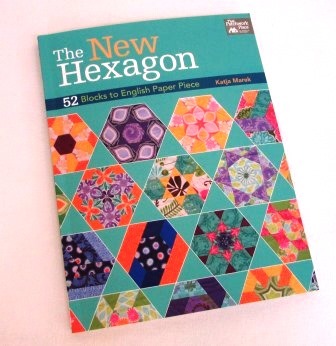 All the 52 block patterns are in the book and then some great projects to work on too. I also got block #4 done before I finished taking photos. There is planned 2 new quilt a longs for the new year that uses the New Hexagon Book. 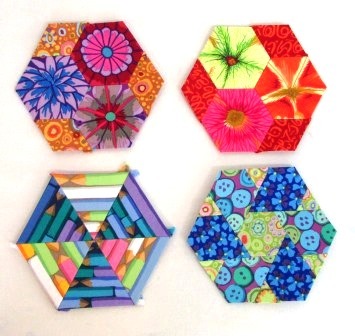 One is the Glorious Hexagons and then Katja is doing a new one called Blocks on the Go. I think I will follow along with the Glorious Hexagon. Yes I have started another quilt. It will be 2 started this month, as I am working on step 1 of Bonnie Hunter mystery quilt today. I hope to have some photo by Monday for her link party. Lovely hexagon blocks - what is the finished size Cathy? Depending on the size this would be a perfect hand work project for me. Wow Kathy, fabulous blocks. 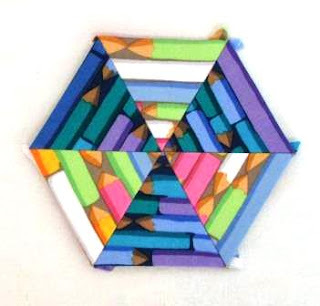 I too have saw the millefore but had no idea how they were made, like any hexie these are a work of art. 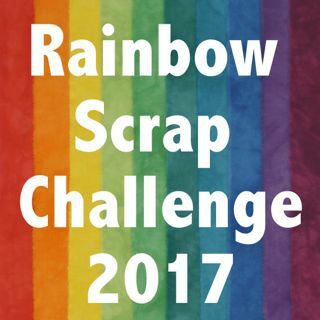 I look forward to viewing your progress. iPad is being a pain, I have tried to comment 3 times. 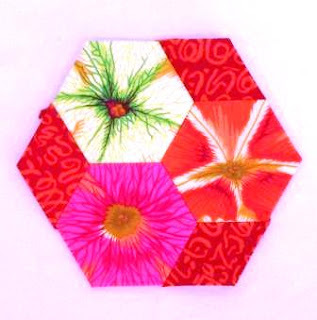 Anyway, I love these and although I do like making hexies not sure I have enough time for these. They are tempting.